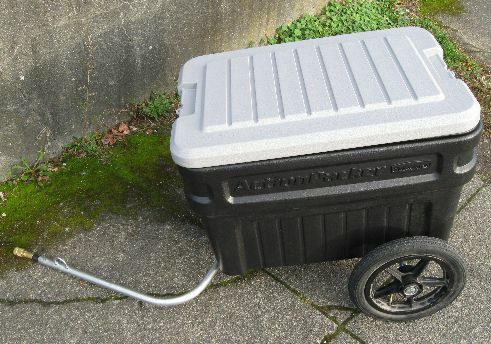 My review and modification of BicycleR Evolution trailer for bicycle. Worked very well. Versatile. 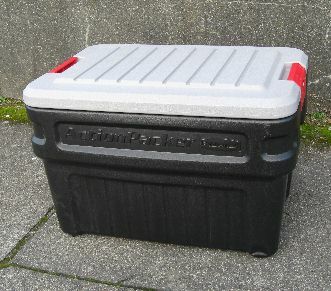 Versatile is the word, I didn't use the original box, but bought my own smaller, lighter box. Warning, the box is part of the structure of the trailer, but it still worked fine. See below. Trailer with my lighter box. I also added some reflective stickers, dots and dashes from a bike shop. That gave the dark box a nice flair. Improved safety on the road. My lighter box still held up well. No cracking of plastic, so far at least. I probably put around 500 miles on it and plan to use it next year as well. No signs of wear except a bit of road dust. Some of my stuff is tied to the top. That may have made it a bit top heavy, but not bad. It tipped over a few times if one wheel went over the curb, but survived OK. Was easy to right and keep going. Here's the original box it came with. Larger. Lid seems to be heavier than it needs to be. 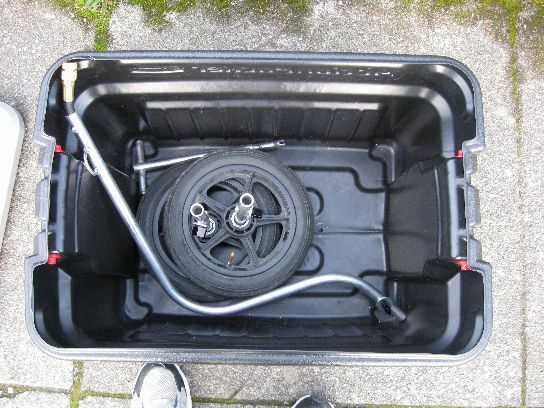 Still, all the components of the trailer fit right into the box with plenty of room to spare. Great for multi-modal transit. I bought mine in Eugene and brought it back on the train. Almost everything fits into my smaller box except the long tongue which hitches to the bike. That can be carried separately. Yes, it all does fit in it's own box. Very simple design. Light weight aluminum like tubes fit together easily. When base is assembled, three bolts stick up through holes in the bottom of the box. Base attaches to the box with fasteners that tighten by hand. 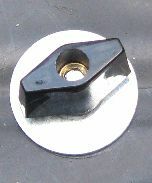 Each fastener comes with two washers (one for the bottom side of the box and one for the top side) to distribute stress from the bolt to the plastic. Clever, and it worked well. Was easy to assemble. Here it is assembled. Whoops, I forgot to mention a little hardware piece, the trailer hitch, that also fits in the box. It goes on the bike. Connected around the quick release skewer of back wheel. Held down by the quick release. It works well, but I look at it and wonder. 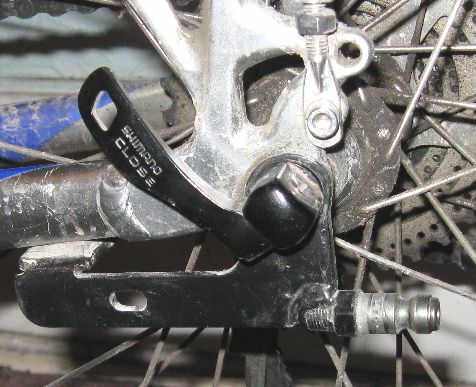 The quick release skewer has to do a lot. Will it snap? It didn't. Will the clamp on the trailer's tongue keep coming off the hitch? It held. 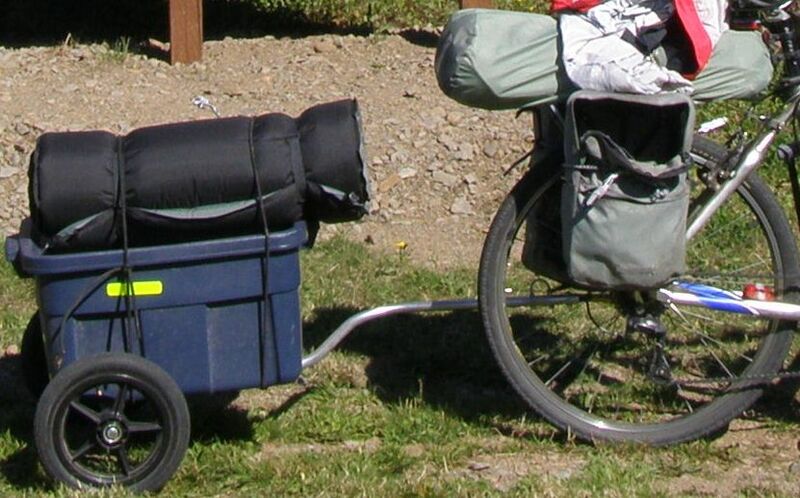 I also used a loop of twine as backup attachment between bike and trailer. Don't want it coming loose in an intersection. It held the whole trip. Someone at a bar / restaurant said it looked like I was bringing a canon with me. 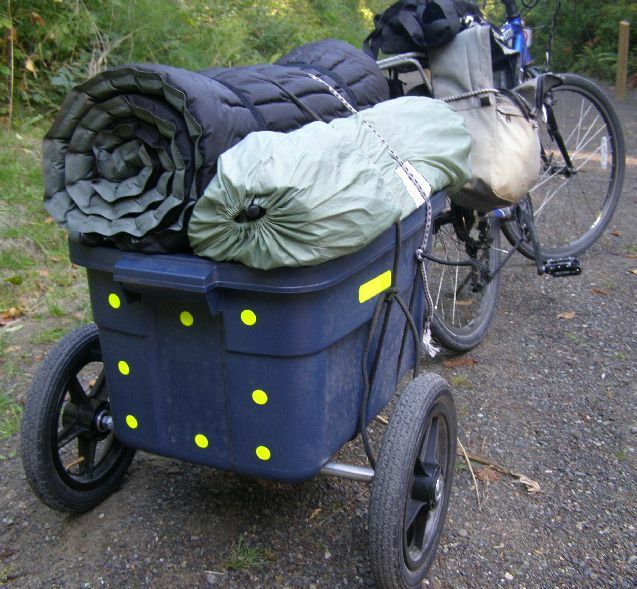 The BicycleR Evolution trailer is made in Eugene, Oregon.